Teeth whitening is the most requested cosmetic dental procedure in Australia, and chances are you already know someone who has brightened his or her smile with this cost-effective treatment. If done correctly and under a dentist’s supervision, teeth bleaching poses few risks to your oral health. Many people experience temporary side effects after teeth whitening, especially with in-office bleaching. These side effects, which normally only last a couple of days, can include tooth sensitivity and gum irritation. However, when you whiten more often than your dentist in Melbourne recommends, you can experience these and other negative effects, some of which may be permanent. Prolonged exposure to the professional-grade bleaching formula can cause heightened tooth sensitivity, discoloured teeth that take on a bluish tint, a breakdown of composite resin fillings, severe blistering of the soft tissues of the mouth. 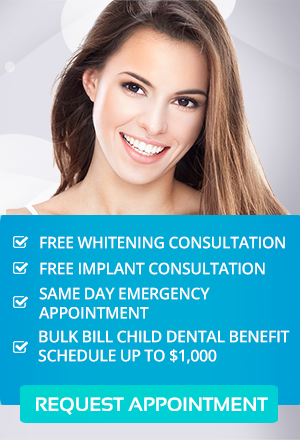 Responsible teeth whitening begins with seeing your dentist in Toorak for a thorough examination. He can determine if your teeth and gums are healthy enough to tolerate the procedure. Issues such as gum recession, enamel erosion and tooth sensitivity may make you a poor candidate for teeth whitening. If your dentist deems you a suitable candidate, you should follow treatment recommendations to the letter. The results from in-office whitening and take-home whitening systems typically last about a year, but your dentist will advise you on how often you can safely perform touch-up treatments. To maintain your whitening results longer without depending on overuse of your whitening trays, you should avoid tooth-staining foods and drinks and see your dentist regularly for professional cleanings to remove surface stains. At Melbourne dental clinic, Simply Smiles Dental, we regularly safely treat patients with in-office Zoom! whitening and custom whitening systems used at home, so contact our dental office today to set up your evaluation. Under the guidance of the dental care professionals here at Simply Smiles Dental, you can easily achieve a brighter smile without causing prolonged sensitivity or permanent damage to your teeth.